Anderson Process offers a number of mechanical seals engineered to drive reliable production and help our customers achieve maximum operational profitability. Click or tap the bar above, then scroll, to view the industry-leading manufacturers we represent for each of our mechanical seal technologies. Reliable Seals for Any Fluid Process Application. Not all mechanical seals are created equal; unique industrial processing applications require specialized sealing technology. Ineffective sealing in an industrial processing operation can lead to catastrophic failures and untold revenue losses resulting from unexpected shut-downs. Reliance on certain sealing methods, such as packing, can also require unnecessary resource consumption, and greatly reduce overall process efficiency and safety. As a longtime seal supplier, Anderson Process understands the importance of equipment reliability — and the critical role mechanical seals play — in industrial processing. Pump systems are a sophisticated and complex set of precision machinery. Operating pump equipment outside the scope of best practices increases stress on internal components such as mechanical seals. Therefore rugged, reliable mechanical seals are essential to maximizing operational uptime. 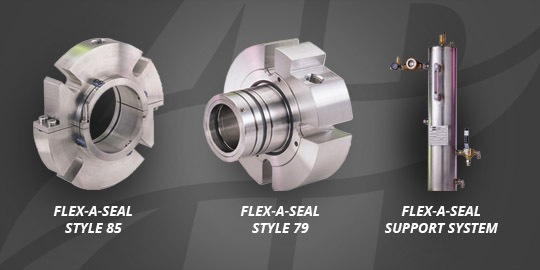 Anderson Process partners with leading mechanical seal manufacturers to deliver seals that are engineered to withstand demanding fluid-handling applications, such as those in the pulp and paper and power generation markets. Our sanitary seals for food, beverage and pharmaceutical manufacturing are designed to eliminate contamination concerns and to optimize uptime through easy cleaning. All of our mechanical seals, regardless of application, are designed to provide extended seal life. Our 50-plus process equipment experts leverage decades of industry experience to deliver effective, dependable seal solutions to our customers. But they also understand that when a mechanical seal fails prematurely, it might be a symptom of a bigger problem. Committed to enhancing the operational profitability of our customers, Anderson Process not only collaborates with customers to integrate the exact seal solution you need, we will look at the bigger picture to help ensure your entire fluid-handling system is performing efficiently, increasing production output and reducing maintenance costs over the long term.